When I saw the original image by ‘Chris Martin Wildlife Photography’, I couldn’t wait to paint it. I hadn’t attempted painting ‘spots’ in a very long time and I must say it was a bit of a challenge but well worth it in the end. I love this image of Chris’s… I was immediately attracted to the different textures in this picture (displayed not only in the fur of the cats but also in the summer grasses of Kruger). I love the composition of this painting too, the tail, gently flicked upwards in typical feline fashion is what makes the painting for me, It was my favourite part to recreate. 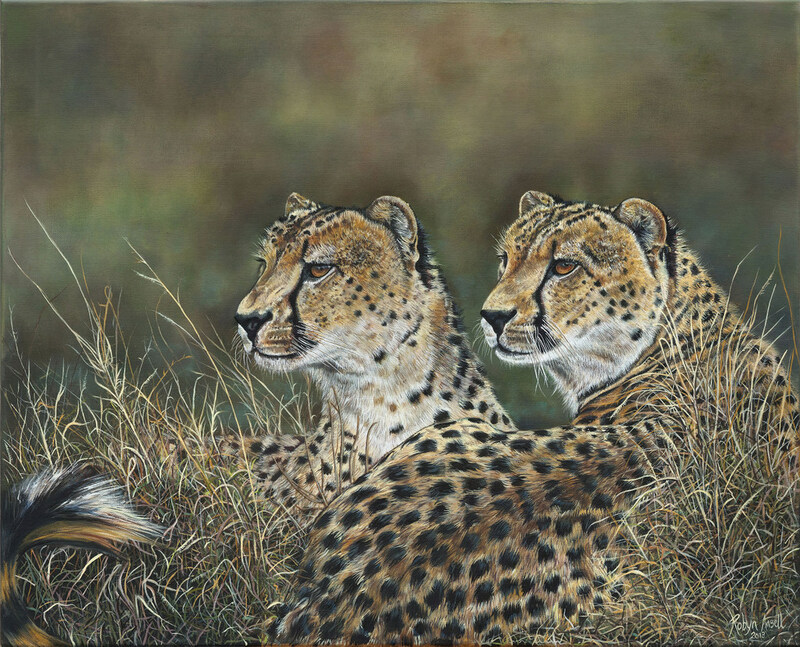 I love the effect you can achieve from carelessly dragging a large paintbrush through a couple of different oil colours at once, it looks like such a mess on the brush but when you drag it across the canvas it somehow merges together creating an effect that recreates something that works as a cheetah’s tail… painting is such fun!